I don’t remember why I picked up this book. It was not because he wrote The Sisters Brothers because I did not clue in that he had written The Sisters Brothers because if I had realized that I would not have picked up French Exit because I hated first forty or fifty pages of The Sisters Brothers and did not finish it. It’s possible that I picked up French Exit because it subconsciously made me think of Jean Paul Sartre and it turns out there is a bit of an existential theme running through the novel. It tells the story of Frances Price and her son Malcolm who go from being wealthy New York socialites to poverty and relocating to Paris. It’s dark and funny and a fun, casual read that for some reason I will never understand was nominated for the 2018 Giller Prize. What do I know. Stanley Park Seawall loop counter-clockwise AKA the last quarter or so of the BMO Marathon in reverse, as seen from iPhone AKA the worst night photography camera. On Thursday I received an email letting me know that I am officially a Berlin Marathon lottery loser and what I realized almost immediately upon reading the email is that I cared a lot more about getting to run Berlin than I thought that I cared (which I thought was not so much). 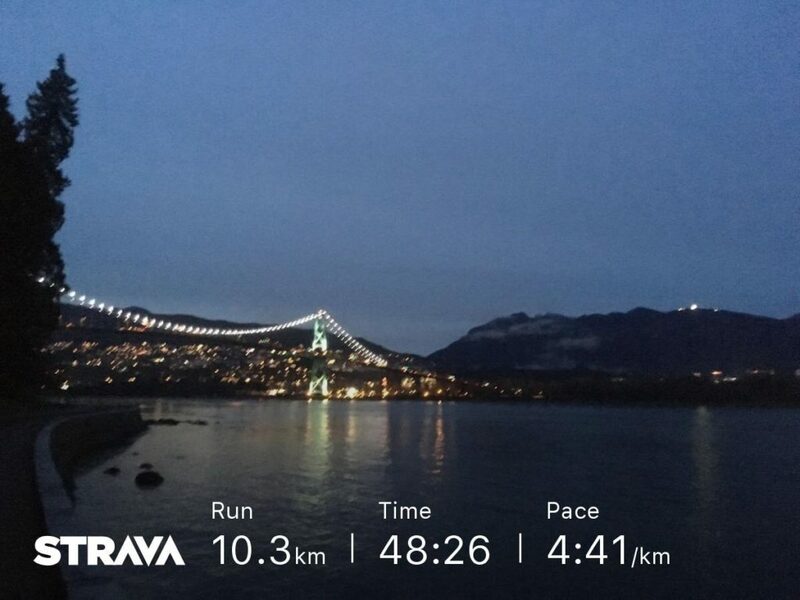 So I signed up for the North Van Run 10K which is on the same weekend as the Berlin Marathon and is of absolutely zero consolation and on the last day before prices increase I changed my registration from the half to the full for the BMO Vancouver Marathon here in May. I’m rather lured by the notion of having a sober second look at this race, and to see what I’m capable of on a course I know so well. I’m still looking out for a fun run that requires a flight to get to, though. So we’ll see. Come along as I read 52 books and run 2,019 KM for 2019. Updates posted Sundays. Probably Mondays if it's a long weekend. Subscribe below and never miss a story. Read my 2018 year in reading here. Read my 2018 year in running here. My reading goal is inspired by the 95 Book Challenge, which you can read about here. Come read with me on Goodreads. Come run with me on Strava. Sure I endeavor to publish a new post every Sunday, but when on Sunday? Sign up to receive notice of new posts, guaranteed spam free! 3. How Does a Single Blade of Grass Thanks the Sun?